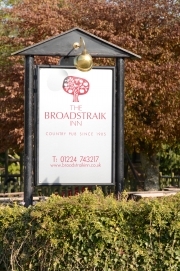 The Broadstraik Inn is located in the heart of the North East of Scotland, 8 miles or 20 minutes drive west of Aberdeen on the outskirts of Westhill. Surrounded by a landscape of rolling hills and forests, it lies midway between the beautiful Royal Deeside & Cairngorms region and the stunning coastline of the North East. Zoom the map by moving the slider up or down. Move the map by clicking and dragging to the new position.